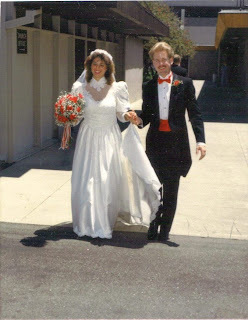 Today, June 21st, is our 21st wedding anniversary. Time flies when you are having fun! We have had so many GREAT adventures, and I can't wait to see what's to come. 21 years ago we had our whole lives planned...we knew exactly how things were going to go and when they were going to happen. We had a plan. He let us know from the very beginning that if we trusted in Him, that He was going to take us on one mighty fine ride. And He has. We've been led to move, been offered jobs, given children to raise, a home of our own, unbelievable friends, family....I am so overwhelmed with thanks when I think about all of it. We have been blessed.